This 80mm rim lid will fit the 8oz Christmas Jumper cups. Has standard size sip hole. 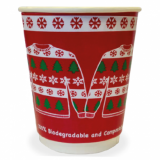 This fully compostable hot cup lid is made from cornstarch-based PLA bio-plastic. It can take high temperatures, and can compost in under 12 weeks.